It felt like the rain would never end. Early this week I think it poured nonstop for about 48 hours? Seriously no joke it never stopped not even for a 1/2 hour. We went to bed it would be raining. We would wake up it would still be raining. Once it finally stopped on Wednesday morning our cat went crazy running up and down the stairs meowing in celebration. March reported record rainfalls in New England. “The monthly rainfall total for March, measured at Logan Airport (boston airport about 12 miles away), is 13.63 inches. It is now the second wettest month in history with the period of record for detailed reporting near Boston dating back to 1872” via boston.com. We thankfully stayed dry at our house with just a few leaks in our roof which was to be expected because it needs to be replaced. Overall Marblehead fared well compared to towns in western Massachusetts, Rhode Island, and New Hampshire that experienced extreme flooding due to over flowing rivers. 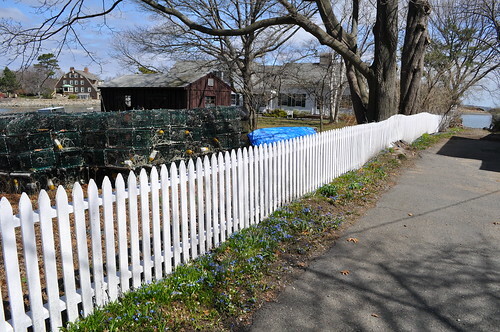 So now that the rain is over we are seeing signs of spring sprout up in Marblehead. Maybe the rain was a good thing? The daffodils are just starting to bloom. 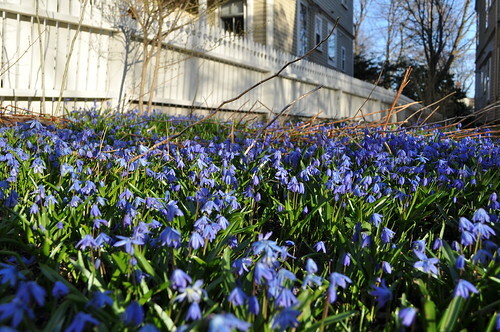 Beautiful blue Scilla flowers are a welcome surprise on my morning walk. Hopefully by next week the forsythia will pop too. hi its been pretty wet in England too but spring arrived in a rush this weekend and our hedgerow turned green in 24 hours – can’t wait for the blossom now! The nice thing about the rain is that it sure nudges nature along. Suddenly everything greens up and pops up. Your little blue flowers are sure pretty. Such fun! Those blue flowers are marvelous!! I wonder what they are?! Also, love Thomas OBrian’s garden! I just bought some seeds to start!! Happy Easter! Love, love, love the Scilla photos. I wish it would just last and last…. One warm spell and it will go by and something else will take its place. Another Header. our forsythia survived all the rain! hoping yours pops soon!